What’s Wrong With a Two-Out Rally? The Ducks definitely have a flair for the dramatic. Everything about their season came down to the wire. With everything on the line, the Ducks took down No. 2 UCLA last weekend and earned themselves a spot in the College World Series playoffs. 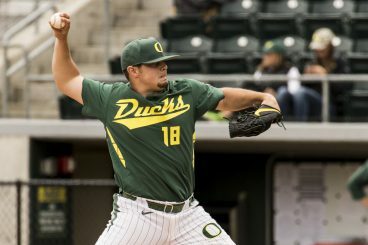 With ups and downs all season for the diamond Ducks, there were few consistencies as Oregon had to fight week in and week out attempting to live up to their preseason Top 25 hype. Josh Graham broke out during the Ducks’ playoff push. The starting pitching situation was anything but settled. Jack Karraker went down mid-season with an elbow injury. Conor Harber told a tale of two pitchers, as he worked his way out of the bullpen into a starting role, and right back in again after failing to make it out of the third inning in four of his first six starts. Josh Graham opened 2015 as a third catcher/designated hitter, shined in the bullpen, eventually cementing himself in a starting role, capping the regular season by throwing a gem in the pivotal third game against UCLA. Tim Susnara pushed the Ducks into the playoffs against UCLA. Last year’s powerhouse Shaun Chase, who led the Pac-12 in home runs in 2014, struggled in his senior season, losing the starting catching role to freshman Tim Susnara. Susnara was the hero of the regular season finale, hitting a walk-off single in the bottom of the 11th, clinching a playoff spot for the Ducks. A number of infield configurations were experimented with, as all-Conference third baseman Mitchell Tolman moved from second to third following Matt Eureste‘s defensive struggles. Daniel Patzlaff filled in at second, and while his bat was not overpowering, his glove in the middle of the field provided solid defense for a team that struggled with errors, ranking 10th in the Pac-12 with a .968 fielding percentage. Heineman received Pac-12 player of the week honors after batting .562 over the last four games. With all the talent in the outfield, head coach George Horton utilized the designated hitter spot to keep junior-college transfer Phil Craig-St. Louis in the lineup, batting him fourth and providing backup for Tolman. As Scott Heineman began to emerge as a must-start option, he was inserted at first, with Craig-St. Louis playing in the outfield and Brandon Cuddy manning the DH role. 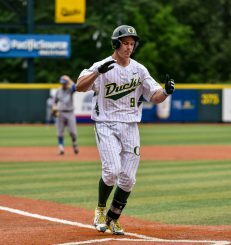 Aside from the spectacular bullpen, consisting of Cooper Stiles, Stephen Nogosek and Oregon’s second all-Conference player, closer Garrett Cleavinger, the only constant was the method the Ducks used to score runs. 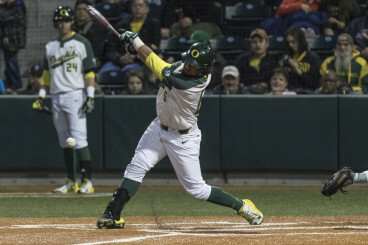 The two-out rally quickly became a staple of the Ducks’ offense: Oregon put up 94 of their 501 runs with two outs — including the final run of the regular season. 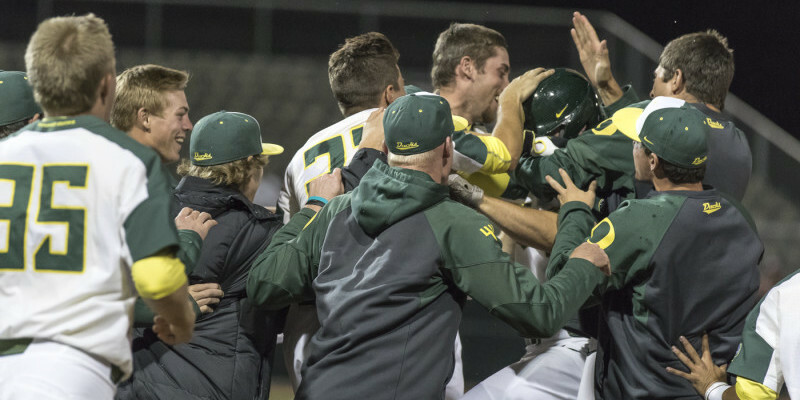 That rally mentality appeared in all areas of their game, as the Ducks were 7-2 in extra-inning games, showing off their tenacity again and again. As May winds down, the Ducks need to find a way to keep the hot streak going as they face off against No. 24 Iowa (39-16) today in the first game of the Springfield Regional. The appearance is Oregon’s fourth consecutive trip to the NCAA Tournament and Horton’s 16th appearance in 18 years as a Division 1 head coach.